Can anyone direct me to Stetson dating thread or other information source? I thought I saw one on here but cannot seem to find it. I actually wear unlined fur felts a lot of the time. Whenever you want to find something in the lounge, just google it. "Stetson dating the fedora lounge" should give you access. I think the Doc is giving the best answer. There are several threads on the subject for dating by Stetson liners, size tags, and crests as well as questions for individual hats and models. They pop right up on google. I have a whole bunch of fedoras, but I've only bought one cap, from Jonathan Cordova (speaks Spanish, so I liked him right away), but I haven't received it yet. I didn't really like them, until I saw a couple of Alan's (@alanfgag), and decided I should have at least one for my collection. I know nothing about caps. I ordered an 8/4 in silk, because I live in Mexico City, and besides I dislike the feel of wool. I know what an 8/4 looks like, but why is it called an 8/4? I know it has 8 panels, but where does the 4 come from? Have looked through the SunBody Association thread? Lots of applicable information there. The owner is a Lounge member. Jhoff_1979 and Zombie_61 like this. Seconded. He doesn't carry the full range of Sunbody hats, but if he has the style you want you'll get it for a lower price and receive excellent service. It's usually a good idea to start here. Yes I have read every post there ,not too much about cracking there ,just wanted to make sure before I order one. Do you still like your 2.5 inch better than your 3 inch brim? Thanks for the link but I have already been there and I am looking for an open crown and did not see what I was looking for there. Yes I am interested in getting an open crown fedora regular palm in a lighter color in no more than a 3 inch brim and did not see one there. Interesting idea. Sometimes I buy nice vintage hats, even if I don't like their particular style. So I have some experience in changing the appearance of a hat with different crown shapes and switching color and width of hat ribbons. I am starting to experiment with interior hat liners. An easy way to alter the color of a bounded brim edge would be nice, but I can't imagine any kind of practical solution that will actually work well and look good. deadlyhandsome and Rmccamey like this. There is a pinned thread called "Links to important hat forum threads" at the top of the Hats section. It has many of the Stetson dating threads in it. Zombie_61, jlee562 and AbbaDatDeHat like this. Yes, I prefer the 2.5” which is unusual for me as I’m almost always looking for more brim. I just put my 3” on eBay. To be honest, I think I wore a SunBody hat maybe three times in 2018, so I’m not the expert. Jhoff_1979, Zombie_61, Steinbockhase and 2 others like this. The ventilated crown should do you better than the eyelets I have in mine. As far as the ribbon goes, the one that comes on the hat is a slip-on elastic one. Definitely nothing to write home about, but it serves its purpose. The one on my hat likes to wander in certain places which gives me OCD, so I'm often having to adjust it back to looking straight and even. Zombie has used pugs on his hat and they look quite nice, so that's always an option and it helps spruce up the hat a little. From my reading about the Sunbody Hats it seemed as though the main gripe about the hats were that it was somewhat warm to wear in the heat,so I figured I would try the vented hat to get around that issue. When Making the Pugs what material do most like to use? And I see that some use pins to hold them to the hat,some use hooks and some just tie on. I wonder which method would best serve the purpose of being able to quickly and easily change to a different color band? Just A Hat Rack and Zombie_61 like this. 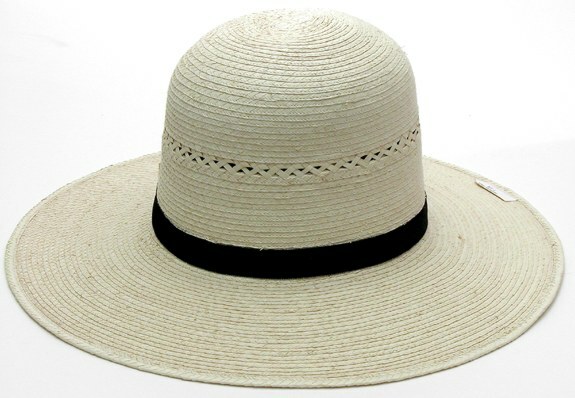 Anybody ver build their own hat over at Panama Hats Direct? What was your experience with? After blocking and ironing the brims don't smooth for 100% and have little wave. I can't understand what i do wrong? Maybe someone had the similar problem? I've built a couple, but have bought more from their listing of ready-to-go inventory. There have been a couple of short delays, but never any disappointments; only great value for whatever quality of lid you select. They aren't exactly the coolest hat to wear. In all honesty wearing a hat in the heat isn't ideal when wanting to keep cool anyway, other than keeping the sun off your head, which the SunBodys excel at. As I mentioned before, the nice thing about them that you can't necessarily get away with with other hats is that you can soak them, which does obviously provide some comfort in the summer heat, and also maintains the "health" of the palm. As far as pugs go, I have no experience in working with them, so I will leave any further advice to the experts.